For the last post in this series of “Seven Little Action Words,” I have resurrected this piece about my dog, Emmie. I simply cannot think of anyone who embraced life (and trust, for that matter) with such unconditional zeal. She is in Heaven now (yep, I am 100% sure that animals go to Heaven when they pass on) but she has left this world with the legacy of her “rally-ability.” She was a trooper, and really…so am I. I pray this peek into her spirit blesses you today and helps you channel YOUR inner Golden Retriever. I took Emmie the Elderly Golden Retriever to the vet this morning. It’s only for a nail-trim, I told her when she balked a bit about getting into the back-seat. It was cold outside, and her old bones don’t like the cold. Finally she did her best to jump into the car, her posterior getting a little boost from me. 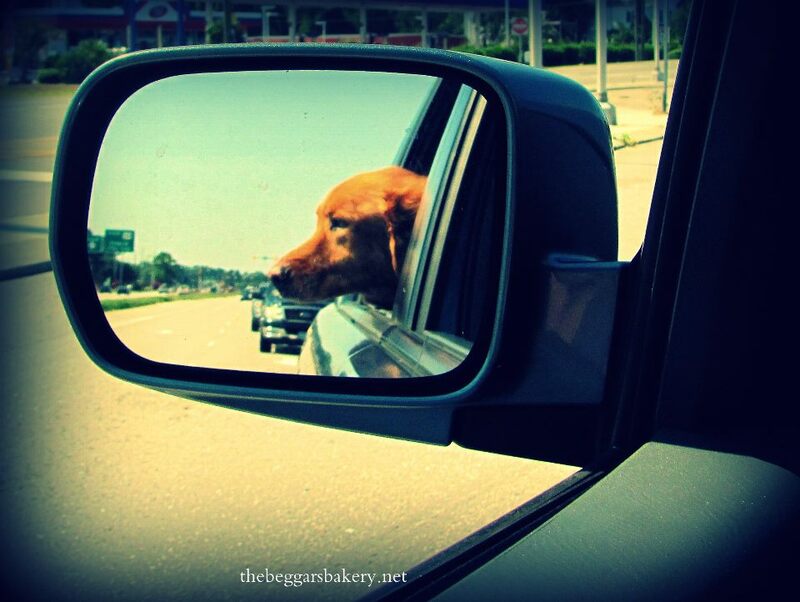 Along the way, I rolled down the window so that my rear view mirror was filled with the vision of Emmie’s face behind me – full splendor, tufts of golden fur and a wide smile of teeth and gums (okay, mostly gums) and eyes squinting in the cold sunlight. She had forgotten that there was a destination involved. She was all about the ride. When we arrived at the vet’s office, she remembered, of course. The last time we’d been here, she was extremely sick. She had suddenly developed a violent gastrointestinal issue and fever, and lost an alarming amount of weight as a result. At fifty-two pounds, she seemed all ribs and misery and the vet was not hopeful for her recovery. She was tested for all manner of parasites and disease, only to come up empty. “She is nearly fourteen years old,” the Vet had said. As this that explained everything. “I know,” I said in return, trying not to bawl. I know that some day, it will explain everything. But not that day. Some people think it’s ridiculous to pray for dogs, but I disagree. As it happened, Emmie’s illness went away as suddenly as it had begun, and she rallied mystifying vigor. Within days of special food and treats, extra rubbing and loving, she perked right up. Once again, she was my shadow, following me around from room to room as I worked around the house even though it meant constant motion and achy joints. That girl is a trooper. So, the last time we were at the vet’s office, Emmie had been poked and prodded, her old bones jostled about. She has a pretty good memory for an old lady. I had to coax her out of the car with extra-syrupy sweet talk and skritches behind the ears. She walked slowly to the door, like I’m not buying it, Mom, but I’ll follow you because I love you. We went into the Dog Door, because our vet has a Cat Section and a Dog Section and ideally, never the twain should meet. Emmie has two brothers that just happen to be cats, cool characters the total opposite of her loopy, goofy, people-pleasingness. Two feline brothers who she is still adjusting to after five years of grafting into the family. So I think she especially appreciates the Dog Door. I know I do. Upon setting paw inside, she developed the shakes – all over. Nervy, full-body shakes that shiver her bones (which I am pleased to report, are getting some meat on them finally). I’m too old for this crap, she is thinking. I whispered comforts to her. But she doesn’t speak the King’s English, so she’s still not buying it. But one of the amazing things about Emmie is her rally-ability. Within minutes, she was finished, neatly tapping her new mani-pedi on the same tiles she had tried digging into and with the same semi-toothless grin she displays with her head out the window. Emmie the Elderly Golden Retriever inspires me with her trust. She just wants to be wherever I am. When I shut the door and she happens to be on the other side of it, she lays against the crack like a live draft-catcher, just to be as close as possible to her master – no matter what. Emmie the Elderly Dog reminds me about trust and unconditional love a lot these days. I have a tendency to dig in when having to face an old obstacle; I have a pretty good memory, too. Oh, no. I’ve been here before! Or simply, I’m too old for this crap. But do I want to be as close as possible to The Master, no matter what? He always takes me gently by the lead. That’s the only way to keep rallying, in my experience. To live. Okay, Father. I’m not seeing the point in this, but I’ll follow you because I love you. And God whispers comforts, too, when I listen. I want so badly to be loopy and goofy with God-pleasingness, following Him around even though it requires constant motion (and achy-ness of the soul, on occasion) – a Trooper. Sometimes I try to have my own way – to be a cool character grafted awkwardly into a family that takes some adjusting to. But other times, I can channel my inner Golden Retriever, with the Father’s help. Those are the best times, spiritually. Jana, once again, you have beautifully articulated a slice of life and love. Thanks for sharing yourself! Thank YOU for taking the time to read the piece. God bless you, friend!